I’m not a huge samosa fan, often times they just kind of taste potatoey without that much flavor. 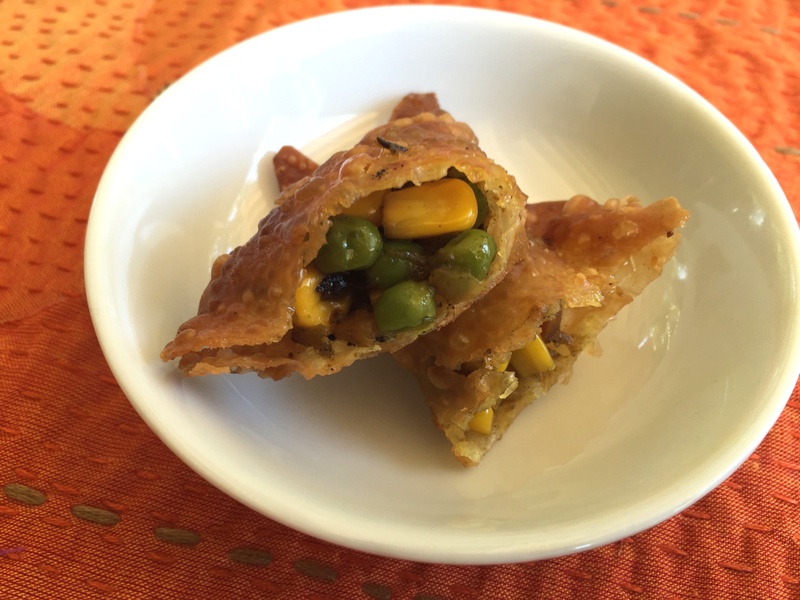 But these little cocktail samosas made using all kinds of vegetables, Cape Malay curry powder and thin won ton wrappers pack a punch. They aren’t authentic Indian samosas, nor are they authentic Cape Malay cuisine, but they are sure tasty. We had these as an appetizer before Cape Malay curry and Chick Peas in coconut curry. Saute onions in coconut oil until slightly browned. Add potatoes and carrots and a little water and cover. Once potatoes are cooked through, add peas, corn, Cape Malay curry powder to taste, sugar and salt. Lay out the won ton wrappers and add a little filling to each. Lightly wet 2 sides of the won ton wrappers with water, then fold over the wrapper to form a triangle pinching the edges together to seal. Heat coconut oil and deep fry until golden.